If you’re interested in purchasing a purple gemstone, the best choice is an amethyst, which just so happens to be the birthstone for the month of February. The color of this gemstone can range from a light pinkish-violet to a deep, bold purple. Differences in color are caused by a number of factors, including iron impurities and exposure to radiation. Amethyst is composed of quartz, which is available in large quantities within the Earth’s crust. Just like quartz, amethyst is fairly hard and will hold up well over time, which is why it is often used in rings and other decorative jewelry. It’s also very affordable and won’t break the bank. There are two green gemstones that are often used in jewelry: emeralds and tsavorites. Emeralds are precious gemstones that are mainly found in Colombia, Afghanistan, and Zambia. There is a very limited supply of high-quality emeralds, which means these gemstones can be fairly pricey. Emeralds are said to symbolize rebirth, so it’s fitting that they are the birthstone for people who were born in May, which is the middle of spring, a season that symbolizes new beginnings. The color of these gemstones can range from a light shade to a very dark shade of green, although darker green emeralds are far more rare and valuable. Tsavorite is actually a type of garnet, though it is green as opposed to red. At first glance, tsavorites look incredibly similar to emeralds, but there are some differences. Tsavorites tend to reflect more light than emeralds, so they will have a bit of extra sparkle. These gemstones are also not nearly as expensive as emeralds. As a result, many people choose jewelry with tsavorites when they cannot afford emeralds. Blue is one of the most popular gemstone colors. One gemstone that is known for its blue hue is the sapphire, which is the birthstone for the month of September. Sapphires actually come in a wide range of colors, but the blue sapphire is the most common. Blue sapphires are associated with royalty and wisdom—in fact, Princess Diana had a blue sapphire engagement ring that is now worn by Kate Middleton. 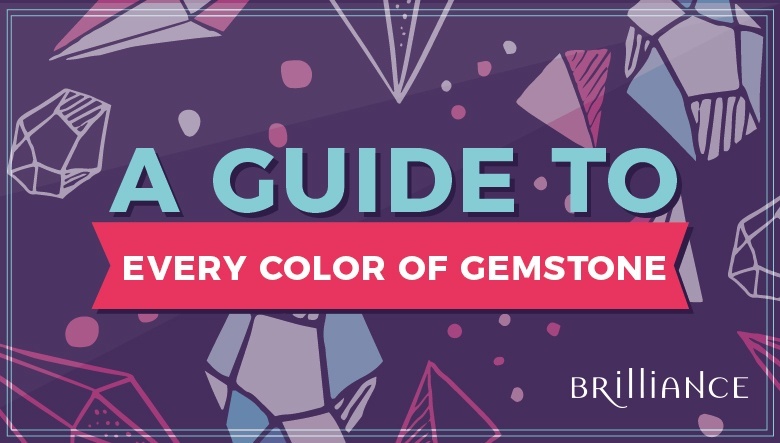 These gemstones are incredibly valuable, not just because of their high demand and rarity, but also due to their durability. The sapphire ranks a 9 out of 10 on the Mohs scale, which puts it right behind the diamond in terms of hardness. Sapphires are typically dark blue, while aquamarine is usually a very pale shade of blue. Aquamarine jewelry is a great gift for someone who was born in March, since this is the birthstone for that month. It’s also ideal for those who love the ocean, since this gemstone is closely associated with the calm and tranquility of water. Alexandrite is another option for people who are interested in buying blue gemstones. This gemstone is often described as an “emerald by day, ruby by night” because of the way that some of the specimens change color. In natural light, color-changing alexandrite is a bluish-green color, but it appears a purplish-red color when placed under artificial light. Alexandrites contain a rare combination of chemicals that cause this change in color and make the stone incredibly valuable. Other specimens take to one side or the other of the color spectrum, and do not exhibit the color-changing property, making them a more affordable choice. To add warmth to your jewelry collection, consider adding one of the popular yellow-orange gemstones, citrine or topaz. Both citrine and topaz are birthstones for the month of November, and at first, you may have a hard time telling these two stones apart. Topaz actually comes in many different colors, though it is well known for its yellow-orange color. Topaz is naturally colorless, but it begins to take on color when it is exposed to foreign elements. Yellow-orange topaz is not hard to find on the market, so it’s not as expensive as the rare blue topaz. Citrine does not have as many color variations as topaz—in fact, it only ranges from light yellow to a deeper brown-orange color. This gemstone is a type of quartz that is mainly found in Brazil, the U.S., Russia, and France. Both citrine and topaz are considered calming stones. Many people believe that wearing these stones can relieve anxiety and ward off bad thoughts. If you want to carry a piece of serenity with you wherever you go, consider buying one of these yellow-orange gemstones. Both, rubies and garnets, are popular choices when selecting a red gemstone. Rubies are precious gemstones, and the July birthstone. Their deep, rich color is created by the presence of chromium, which is also responsible for their unparalleled glow. Rubies can have hints of brown or orange, but the most valuable type has a dark red color. They are often used in jewelry because of their durability and brilliance. Unfortunately, rubies are very rare and therefore expensive. In fact, some are even more expensive than diamonds. But all it takes is one look at a ruby to know that they are worth every penny. Garnet is another popular red gemstone and is the birthstone for people who were born in January. Unlike rubies, garnets can be found throughout the world, including Greece, Russia, India, and the Czech Republic. Some people who believe in ancient superstitions refer to the garnet as the “Gem of Faith” because it is said to bring good fortune to anyone who wears it. Opal is a unique gemstone that is the birthstone for the month of October. Looking at an opal gemstone is like looking through the lens of a kaleidoscope. These beautiful gemstones contain many different colors that come alive when light hits the stone. Although opals contain flecks of various colors, they do have dominant background colors, including blue, black, and white. In addition to their beauty, opals are often associated with good luck, which is one more reason to add this gemstone to your jewelry collection. Which color is your favorite? Once you decide, head to Brilliance.com to start shopping for the perfect piece of gemstone jewelry!